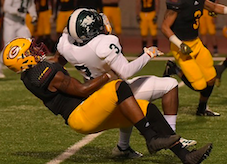 Grossmont JARIUS BURNETTE III is wrapped up by a Saddleback player on Saturday night. 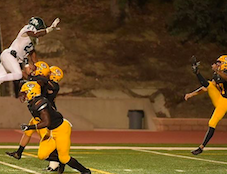 MISSION VIEJO – When Grossmont College’s KYREE WOODS had a strip sack and fumble recovery for a touchdown in the second quarter on Saturday night, the Griffins may have reached a high-point in the season. 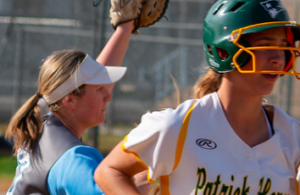 Coming off their only victory last week, Grossmont quickly bounced back from an early two-score deficit to tie the host Saddleback Gauchos at 14-all and the Griffs’ confidence may have been as high as its been all year. Saddleback stretches for the goal against Grossmont on Saturday night. 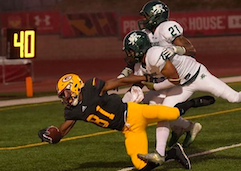 The Gauchos, seemingly hitting a bit of a bump on the road to their big game next week, eventually stemmed the tide and held off Grossmont for a 45-30 National Southern League win. The Gauchos are 4-0 in the and will meet Riverside for the conference championship next week. Former Griffin and Valhalla Norseman Jerome Johnson scored two touchdowns for Saddleback (6-3, 4-0). Grossmont battled back again in the second half after falling behind by two touchdowns once again at the half. Grossmont freshman JARIUS BURNETTE had a 57-yard touchdown run for his second score of the game, then ETHAN ALBERTSON booted a 37-yard field goal to bring the Griffins to within 28-24. Johnson’s second rushing score of the game put the Gauchos back up by 11. However, Grossmont sophomore FABIAS SHIPMAN III had a 19-yard touchdown run to close the lead to 35-30 with 11:45 left in the game. The Griffins couldn’t score any more from there. Burnette rushed for 136 yards on 20 carries for the Griffs. On one play, the back lost his helmet and was contacted hard by a Saddleback player. Burnette was shaken up but was able to continue. Grossmont goes for a punt block on Saturday night. MATTHEW LINTON had a team-high five receptions for 45 yards for Grossmont (1-8, 1-3). Grossmont’s BRYSON COLLINS had nine solo tackles, including three for loss and a sack, as well as, two pass breakups. In addition to his defensive touchdown, Woods, a freshman out of Steele Canyon High, also had a sack. The Griffins played well on special teams, recovering a pair of muffed punts, the first of which led the Albertson’s field goal. Former Mountain Empire defensive star BLAKE JARRELL, a freshman, recovered one of the three forced fumbles on the day by the Griffins on a punt early in the fourth at the Saddleback 28-yard line that set up Shipman’s touchdown. 1 12:48 Saddleback – Johnson,Jerome 1 yd run. (2pt conversion rush by Patterson,R. failed). 1 11:26 Saddleback – Smith,Dejour 28 yd pass from Patterson,R.. (2pt conversion pass by Mailangi,Sefo is good). 1 07:51 Grossmont – Burnette,Jarius 1 yd run. (Albertson,Ethan kick is good). 2 01:35 Saddleback – Patterson,R. 29 yd run. (Freem,Matthew kick is good). 2 00:20 Saddleback – Derrico,Austin 26 yd pass from Patterson,R.. (Freem,Matthew kick is good). 3 09:43 Grossmont – Burnette,Jarius 57 yd run. (Albertson,Ethan kick is good). 3 02:37 Grossmont – Albertson,Ethan 39 yd field goal. 4 14:23 Saddleback – Johnson,Jerome 4 yd run. (Freem,Matthew kick is good). 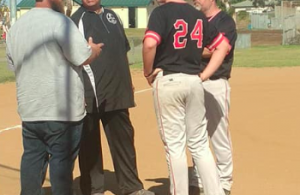 4 11:45 Grossmont – Shipman III,F. 19 yd run. (2pt conversion pass by Abt,Brady failed). 4 05:21 Saddleback – Freem,Matthew 37 yd field goal. 4 01:21 Saddleback – Patterson,R. 1 yd run. 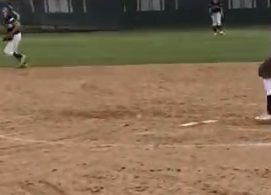 (Freem,Matthew kick is good).